Now they just need a HID version of this for yard lighting. Saying this looks like a Form 109 is an extreme insult to a classic fixture. This POS most certainly does NOT look like a Form 109. What does a Form 109 even look like? Funny, one of these things replaced a form 109 or similar clam in a nearby hood. The pole still has the ballast on top and all. Hope they had a good reason to do it, like a dead ballast. It looks like a spherical, low profile Form 109. Copyright issues if they ever copied the shape exactly. Unless it happened to be GE that did make them. Why I like LEDs on top of other lighting tech? LEDs = Upgrade 95% of the applications. (That is if you avoid eBay's LEDs). LED brainwash? No, people uses them cuz they work well for them. And the lens looks nothing like a real Form 109. This metal turd doesn't even resemble a classic Form 109 in the slightest way. BTW I think this think is like 6650 lumens or something. 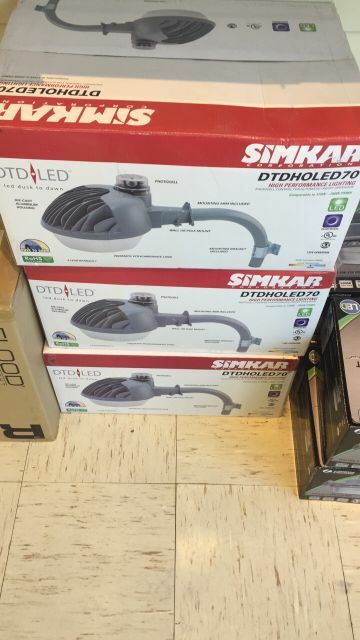 About as bright as a 70W PSMH, and guess how many watts this LED fixture uses? I am not surprised they claim it is equal to high wattage PSMH. I have seen 2000 lumen LED wallpacks rated to replace 34000 lumen 320w PSMH lamps. Yea right. Maybe a lamp that is dimmed out and just turned on but the real thing is over 10x as bright. I still can't get over that, just 2000 Lumens! It's right on the box. 70W, same as 70W PSMH and only a little brighter than the 70W PSMH. I suppose this could be a replacement for a well-used 100W PSMH fixture since MH lamps loose a lot of lumens as they age but that's being generous. I didn't see the wattage on it. You may as well use a HPS light if you're looking for high efficiency. How much will these dim? I haven't kept up on LED but I understand it continues to improve (one would hope). As lighting, they're boring for me; but if reliable enough and not a headache bomb, I would use one if need be. Funny thing...one the most recent NEMA 175w mercury I got from craigslist, the seller had replaced it with LED and as he gave me the fixture and spare stuff, he muttered about liking the light from the mercury better than the glare bomb behind him as we stood in the driveway after dark, lol. Led is terrible on me. I like the color of the 3500 and warmer ones, but still the glare kills me, and screws with my astigmatism. even MH is less glary than these! I also saw some gross flyswatters being put up in the city, the stupid gentrification has begun! They're like real flyswatters. Use them a few times, and they're already falling apart! Light above looks more like a small GEC clamshell used in England than a Form 109. The brochure for these LEDs. Is it help that the lantern not viewed also from beneath, so that the optical system and the LEDs can be seen? LOL everyone, that was one swell "welcome back Jace" comments LOL nice to see friendly comments! @ Kev: that's about equivalent to 175W MV! I thought my 6500 lumen 70w CMH was bright. The SON won't be a good replacement for 175w merc because of horrible nighttime visibility, but the CMH would be perfect. I still don't understand why LEDs have taken off like this when CMH is TONS more efficient, more reliable, cheaper, and in some cases have a very long rated life. And the bulbs are easily replaceable! That too. Plus if they dayburn on a very hot day a magnetic ballast isn't going to fail like an electronic LED driver. Plus, if the ballast does fail for whatever reason, it can be replaced for about $25. I wonder how an electronic ballast would do. Electronic HIDs have existed since the 90s (most LOA HID fixtures used electronic ballasts) but they've proven to be very unreliable, especially for street lighting. electronic HID ballasts have been pretty much limited to indoor uses like track lighting where compact size and no noise are requirements. And AFAIK they were only really used for lower wattage HIDs. Not sure if they make higher wattage electronic ballasts. They never took off (thank god) but I'm pretty sure those Cooper OVGs in New York City have electronic ballasts in them. If 1000 Watts is higher wattage, there are lots of electronic ballasts available for those. I even have 2 400 Watt electronic ballasts. $25 for a PSMH ballast? Sounds too good to be true. Is it quality ballast? There are these canopy lights under near the doors at my church. Long ago there was a tornado (2005) and the roof got torn up and water leaked in. It got into the canopy lights and killed the ballasts. They sat dead for almost 10 years until they decided to do something about them. Apparently the company that could fix them would charge 200 bucks per light to fix them but they couldn't afford that. So I showed them the inexpensive Plusrite ballasts and they decided to try them. They were installed in 2014 and are still working well. Cheap doesn't always mean bad! That's true too. I have a Plusrite 70w mogul base PSMH lamp and the quality is quite good. It doesn't even rattle when you screw it in. My relatively cheap Nanolux ballast seems to be of good quality. But how to you clean it when the fan eventually gets filled with dust? Can it be disassembled? If not just stick an air compressor to it and let fly. I use that for cleaning out laptop and desktop computer fans. It can technically be disassembled, but it says that there are large capacitors in it, so it would be unsafe to. I suppose I can use the compressed air, but it would be tricky. Be sure to jam the fan before you let it fly. Compressed air make those things spin to ungodly fast RPM. Well beyond what they're rated for. I've heard they can EXPLODE if spun that fast. Could be Internet BS but to be safe than sorry. Jam that fan. A screw between the blades is usually enough. Just don't let the thing fall inside the case. Maybe a pen could do it too? Now I want to test my spare computer fans with compressed air. Update: I tested one of them, and it didn't spin very fast. I still wouldn't risk my ballast fan. The fans I clean are usually Intel CPU coolers, 80mm and 120mm fans. I usually stick something in it to keep them from exploding too.